Already unhappy with the ansar military presence in the factory, for hundreds of workers arriving for the Saturday morning shift hearing of the assault was the last straw; 400 mainly women workers had recently been sacked with no warning and without receiving wages owed. The new shift refused to begin work and demonstrated for payment of wage arrears, punishment of the ansars, and removal of the factory manager. The factory bosses failing to respond, at 9.30am a scuffle occurred between demonstrators and ansars, who retreated to their camp in the factory grounds. 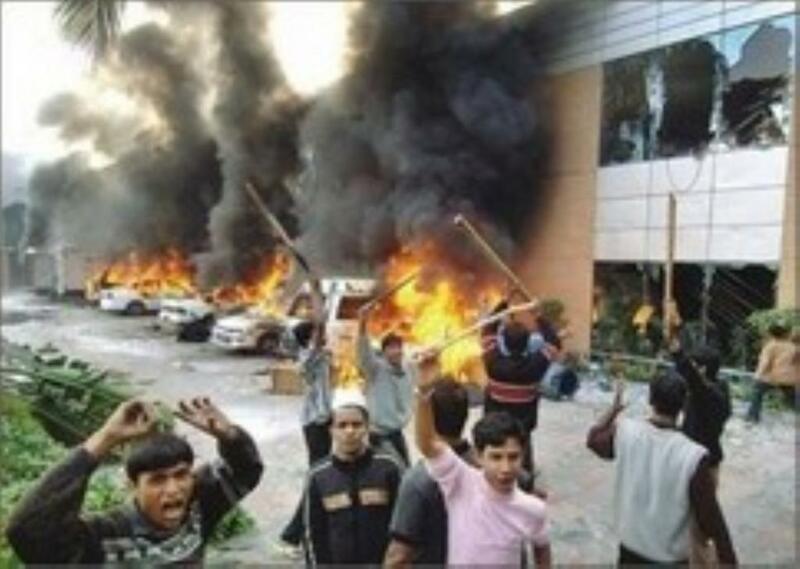 Workers then attacked the ansar camp with sticks, stones and bricks. The ansars responded with rifle fire into the crowd, injuring at least two workers with serious leg wounds. Workers spent the next four hours vandalisng the factory until a huge contingent of police and soldiers arrived and eventually brought the situation under control by 2pm. The ansar camp has since been removed from the factory. Dhaka, the capital; on Sunday morning 300 workers of Polonia Garments Ltd gathered in expectation of payment of owed wages, as promised by management. Finding the factory gates locked, furious workers began ransacking the factory. Events escalated when over 1,000 workers from neighbouring factories - armed with bamboo sticks and stones - joined Polonia workers and attacked other factories on the Dhaka-Tangail highway. Highway traffic was blocked for two hours. Workers spread the trouble throughout the area; 15 factories RMG factories and four shopping centres were attacked as rioting continued through the day. Strikes demanding pay rises occurred in at least three other factories and 60 factories were closed in response to the violence. Later, at around 8:30pm, roving workers set fire to an RMG factory in Gazipur, damaging a huge quantity of fabrics and yarns. As inflation continues to eat into workers wages and demonstrations and strikes increase, the employers' organisation - Bangladesh Knitwear Manufacturers and Exporters Association (BKMEA) - has announced it will open five 'fair price shops' to sell subsidised staple foods to its workers. They have also hinted at an 'inflation allowance' (probably 20% of current wages) being paid. Workers need United movement & Make Strong CBA in there Factories . Goverment ,BJMEA ,BKMEA need Cooperation to Workers for encrese Productivity in the factoris.